Onyx is a young cat who does not like being in a cage. 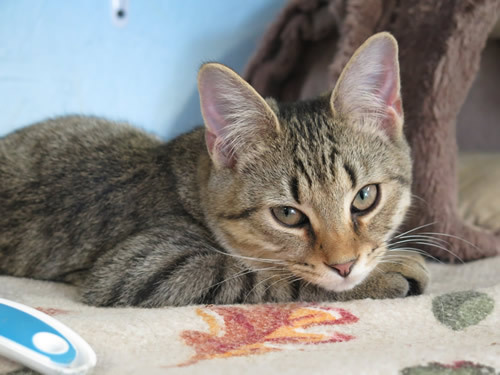 This young cat is going to get into mischief, so he will need to be kept busy with playtime and vertical spaces he can safely explore. 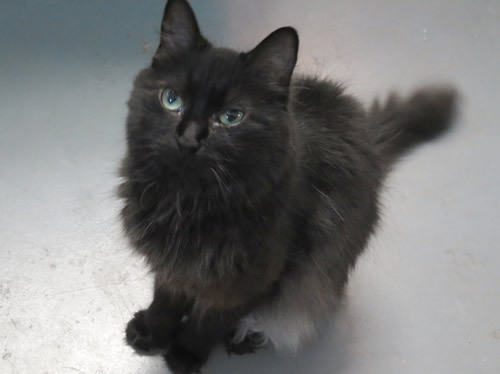 Onyx was transferred to another shelter and was adopted. 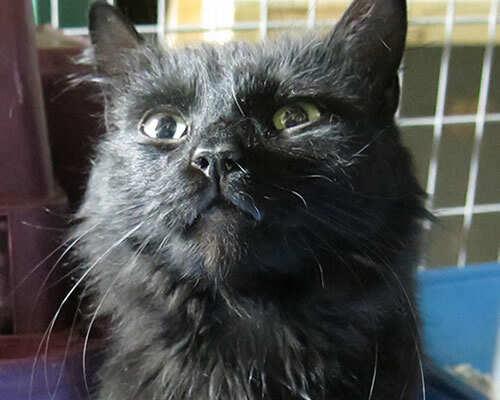 Justin is a beautiful teenage kitten who came in with his siblings as a feral. He was the most shy of the group but he's learned not only to trust people but to come running for affection. 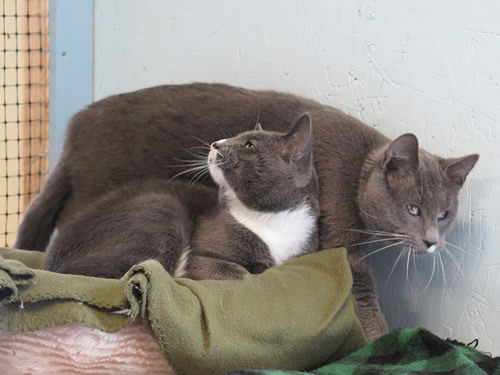 His brother Jason recently headed to Portland to find his forever home and Justin might be missing him a little bit. He was not ready to make that trip at the time. Since on his own, he has become more self-confident. He's been neutered and he's up to date on everything. He will need a bit of patience at first, but he's a clean, affectionate kitty. Call 999-1075 to make an appointment to meet Justin. 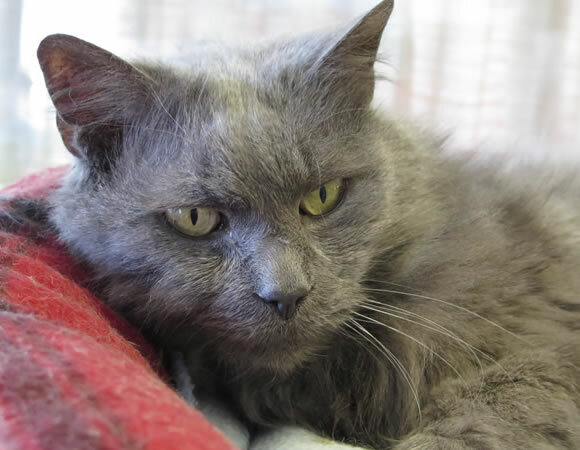 Justin was transferred to the Animal Refuge League of Greater Portland and was adopted. 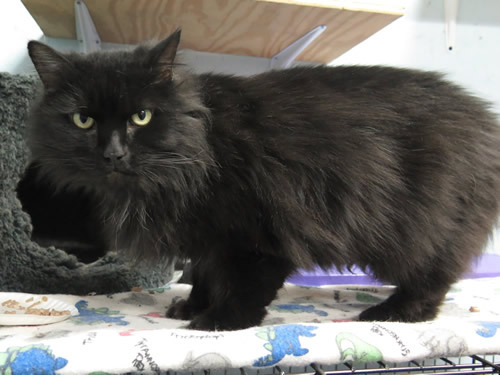 This longhair beauty is a spayed female, about 7 years old. She came in with her friend Peanut, who left for Portland recently. We don't think Crackers misses Peanut, in fact, we think Crackers is quite happy being solo. She's in with young Justin but Crackers is definitely the boss. Crackers loves to be up high and have the window seat; she loves attention from people. If you'd like to meet Crackers, please call to make an appointment 999-1075. 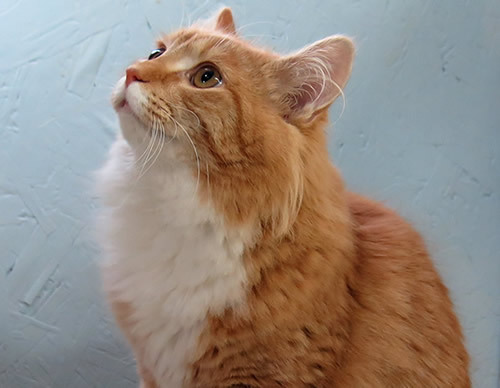 Crackers was transferred to the Animal Refuge League of Greater Portland and was adopted. Shadow is the most mellow, get-along-with-everyone cat we've seen in a long time. He came to HHPR because of a chronic constipation issue and being overweight. After some medical intervention and a change in diet, this guy is on the path to a long life. He spent several weeks in foster care so that his regime could be monitored. He's been at our Adoption Center for several weeks in a room loose with other cats. He loves everybody. Recently he went on a field trip to the Caribou Public Library where he was among a class of third graders and other cats he'd never met. He was right at home. The volunteers all love this guy but none are able to adopt him. 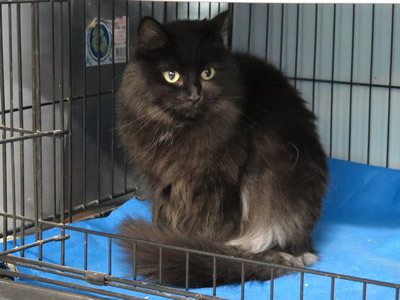 Shadow will do well in any home as long as they can keep him on his diet and have the financial means to provide medical treatment should it become needed again. Shadow was finally adopted to a Caribou family and is doing great. His new family includes 2 dogs and a cat. Shadow spooning with his friend, Fergie. 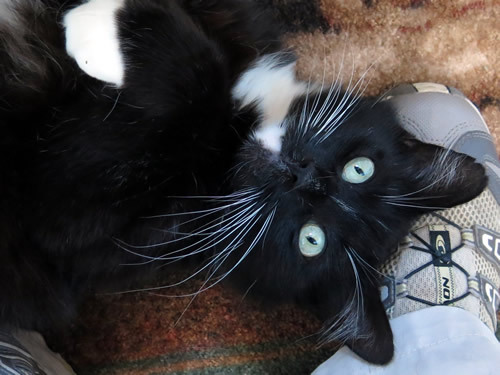 Young Cosmo is a very playful teenage kitten who came from a feral situation. 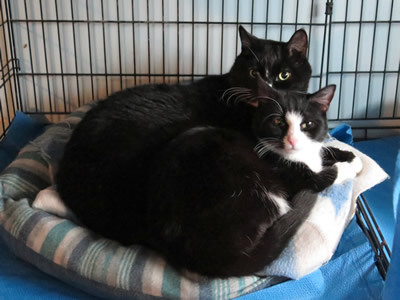 He and his sister have taken a bit longer to socialize but now Cosmo is ready for a forever home. He's a smart, precocious guy who will steal your heart. Cosmo has already been neutered and is up to date on everything. He loves to climb and have a window. Update: Cosmo was transferred to the ARLGP and was adopted! He's being spoiled. Spec is a special girl. 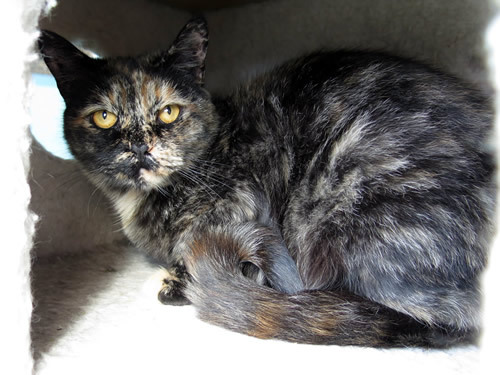 She came from a hoarding environment and had some rough days in her early time with HHPR. She was about a year old when she came to us in June 2014. It took several weeks for her to recuperate physically and emotionally from her past. She has settled in to life at our adoption facility and enjoys some freedom in one of our rooms with a window to an outside pen. Spec babysits the feral kittens and has warmed up nicely to everyone. She can be a bit shy when she first meets you, but that quickly passes. 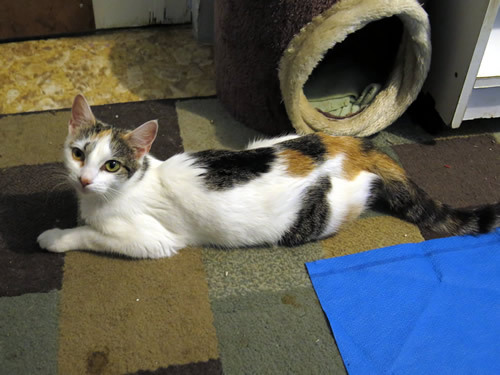 This young female calico came to HHPR with a litter of kittens when she was just a kitten herself. She was a good mother to her 5 babies. Some of them were born without tails! They had a tough life but the kittens have been adopted, Tessa has been spayed and she has been at our adoption facility for a several weeks. 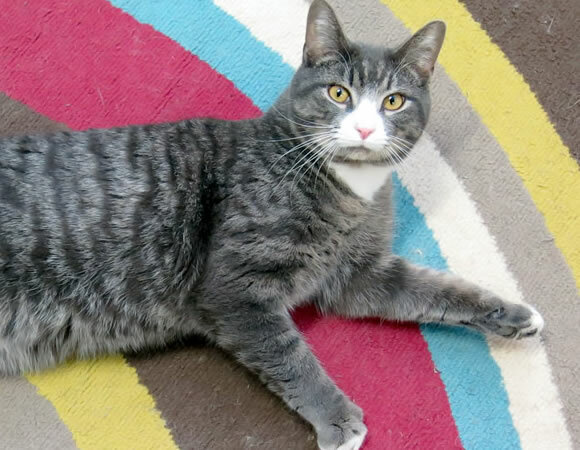 Tessa is very playful - she's picked up where she left off before she became pregnant. She loves to be with people and sit on shoulders! Update: Tessa chose her forever family and is the queen of the household. Georgie is a character. She's got to be with people and participate in everything - including the conversation. This is not dull companionship. The more you get to know Georgie, the more you'll realize how special she is. 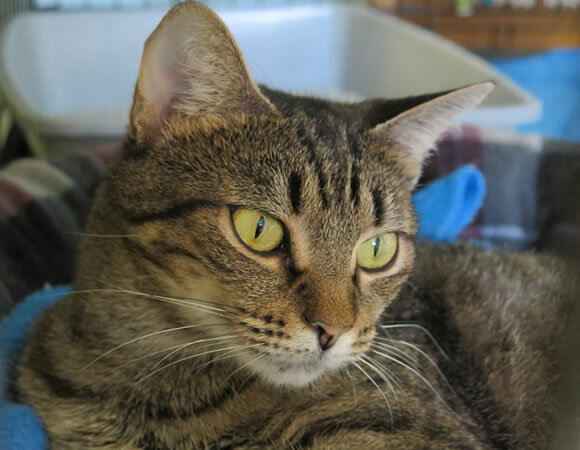 Georgie has learned to get along with other cats and has even become familiar with a service dog who comes to the Center with a volunteer. Georgie has come a long way and has earned the affection of all the HHPR volunteers. She now enjoys being held and will tell you when she's had enough. If you don't pay attention to her signals, she will yell quite plainly that you need to listen! Georgie was finally adopted to a retired person in Caribou. Barnes and Noble are two young adult guests residing with us. 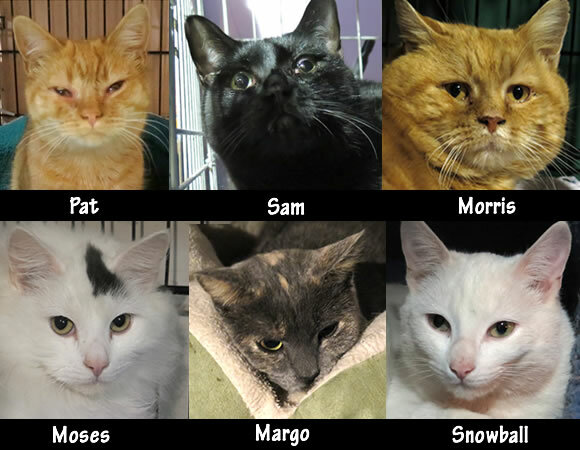 They are fixed, very well mannered, extremely unique in appearance, happy, healthy and hoping for a home together. 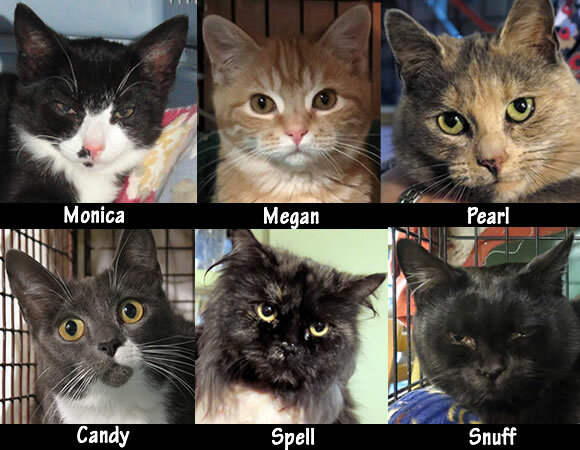 You will find that adopting these two very well-mannered cats will not only be a blessing to the happiness of your family, but your friends and family will envy you. Don't miss out on this lovely and loving addition to your family. They will be great with any type of family situation. Barnes and Noble were transferred to ARLGP. Precious is this cat name, a loving tuxedo about 2 years old. Transferred to ARLGP and renamed Prince. 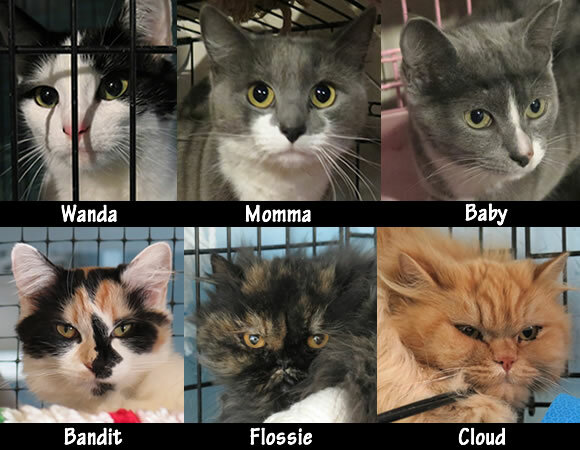 Wanda (1366), Momma (1367) and Baby (1369), Bandit (1363), Flossie (1343) and Cloud (1344) Momma and Baby were adopted together as were Flossie and Cloud! That's what we like! 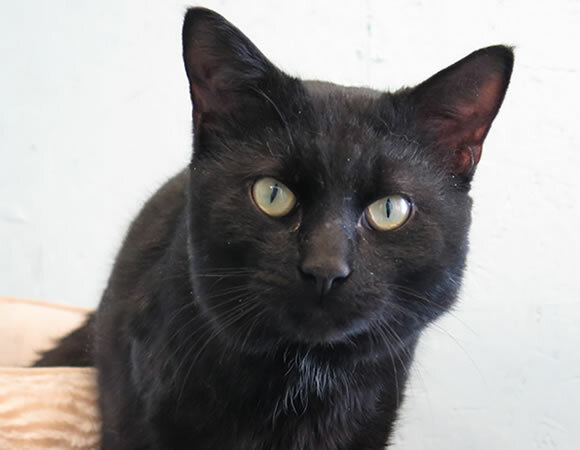 All black except a hint of white on his chest, this 2-year old fella is ready for home. He's ready with head butts and purrs. Very sweet cat. 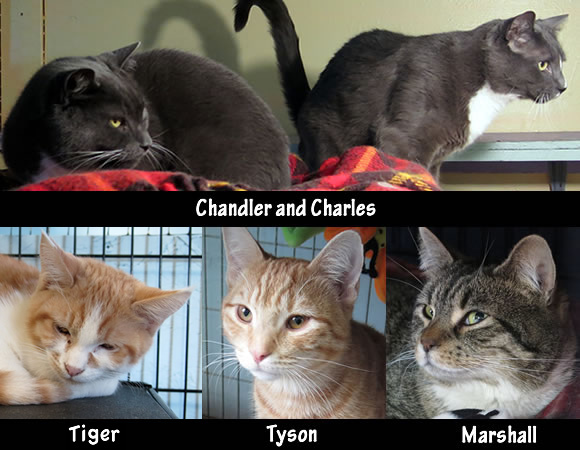 Hudson traveled to Westbrook to find his fortune at the Animal Refuge League of Greater Portland and he struck gold! He was quickly adopted. This gray tiger is just 2 years old. He's a very social guy and is very eager to interact and play. He also loves to talk! Maxwell is a very handsome young guy, just 5 years old and in excellent health. He is willing to get along with others. 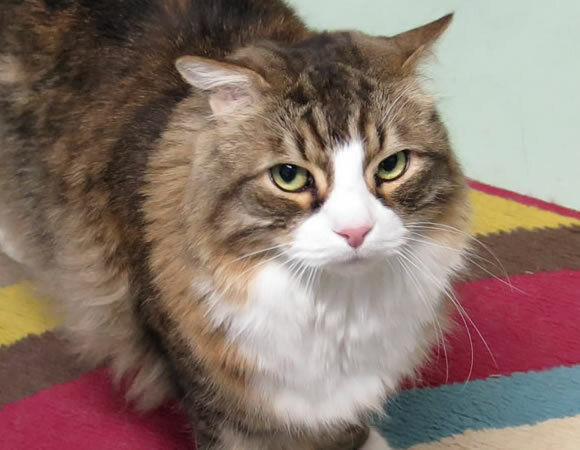 He is longhaired and will need someone who likes to groom. 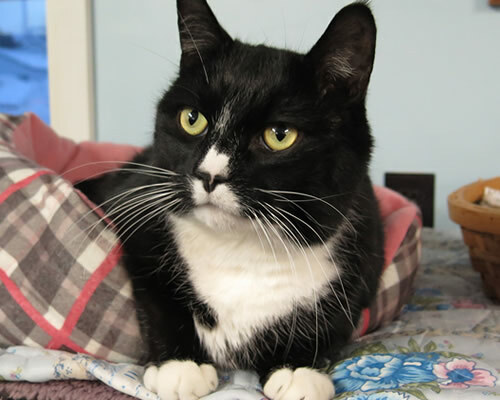 This mature gentleman would like a fairly quiet home but does get along with other cats. NOTE: Rocco went to the Animal Refuge League of Greater Portland where he was adopted. This handsome fella escaped capture for many years but the Fort Fairfield police did not give up. They finally got him and brought him to HHPR where we learned he was not as wild as he looked. He's a big love. 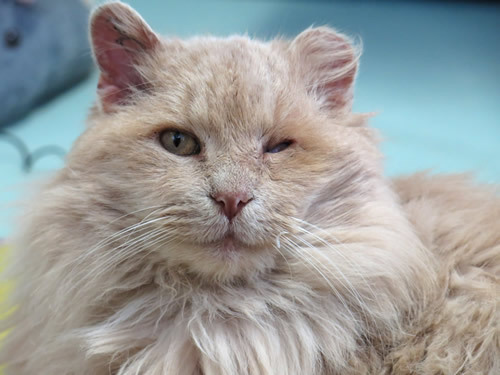 He is blind in one eye and lost part of his ear to frostbite. After getting him all medically cleared, he spent a short time at our Adoption Facility and quickly found his soulmate. He was shaved of his mats and went home quickly. Princess is a young tiger who came to HHPR with kittens. 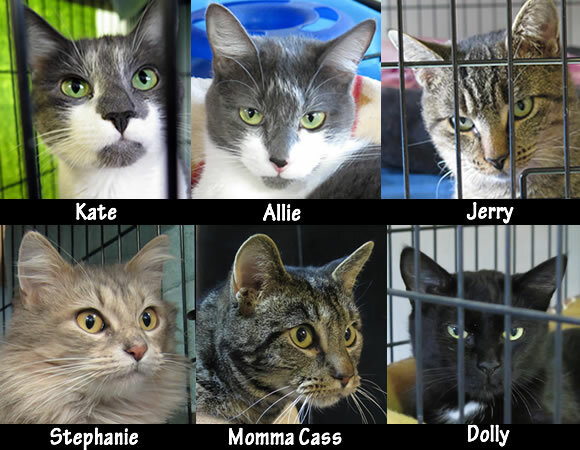 Her kittens have been adopted and she's spayed and ready to go home. Princess is a loving cat but does not care for other cats. UPDATE: Princess went to the ARLGP in Westbrook and was adopted! 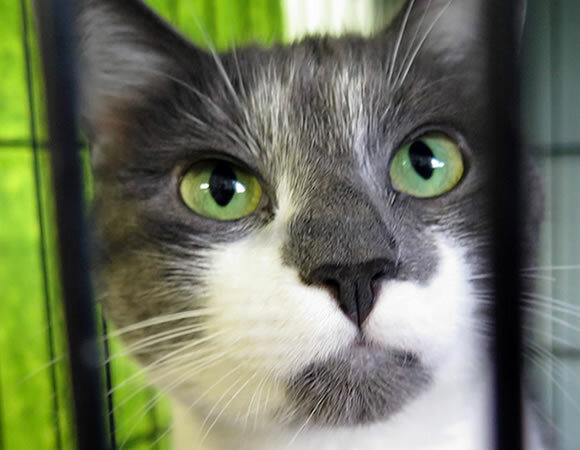 Kate is a young gray and white shorthair beauty. She came to HHPR with her sister, Allie. UPDATE: Kate was transferred to the ARLGP in Westbrook and was adopted.